The GBOX Bottom Feed Box Mod by GeekVape is a 200W TC box mod that is designed to be both powerful and reliable bottom feeding device with an 8ml bottom feed juice capacity and can be powered by using dual 18650 (sold separatly) alongside the GBOX is the Radar Bottom Feed RDA; a brand new rebuildable with a 5ml juice well and a unique building post. The GBOX is equipped with the AS chipset that is capable of up to 200W and a multitude of functionality; The GBOX has a full temperature control suite, VPC support, and a bypass mode. 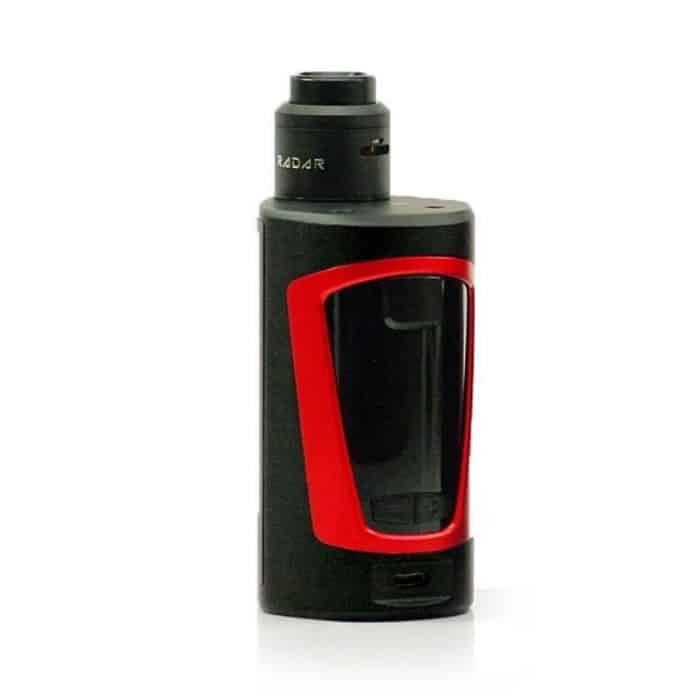 The GBOX is powered by dual 18650 batteries (sold separately) and are housed through a bottom locking latch door with the 8ml bottom feed bottle. The GBOX can be charged through the USB port up to 2A and utilizes the chips smart charging management. The enlarged OLED display is neatly shown on a vertical menu with vape stats including resistance, amps, voltage, puff counter, and battery life. Along with the GBOX Box Mod is the Radar Bottom Feed RDA; a 24mm rebuildable atomizer with a unique dual staggered directional building post. Each posts on the Radar RDA features two terminals that are measured at 3mm in diameter and the coils are held by top mounted Allan screws. The Radar RDA has a 5mm deep juice well, perfect for dripping or squonking your favorite E-Liquid. Airflow enters the Radar through two dual slotted air slots, one measuring at 9.5mm by 2mm, the other measuring at 3mm by 1mm. A 10mm wide bore 810 delrin drip tip comes pre-installed on the Radar but can be switched off with the 10mm 510 delrin drip tip for user preference. With an amazing output and a powerful chipset, the GBOX 200W TC Squonk Kit by GeekVape offers bottom feed users versatility through functionality. Not the best, but great strong vape.